The thermally formed AmeriWalls have structural strength and durability and will not crack or yellow. When purchasing a 3-piece shower kit, you’re purchasing a product that’s designed to be long-lasting. Acrylic shower walls are made with quality material that’s easily cleaned and less likely to promote mold and mildew growth. Installation is simple and quick. After the appropriate plumbing has been completed, the enclosure walls can be installed over building code approved drywall in a few hours. Tear out and installation can be done by you or your contractor. Our 3-piece tub/shower stall kits can be purchased in bulk for companies who are upgrading or installing a large number of baths or showers. By using one of our prefab shower kits, you can change the entire look of a bathroom, making it brighter and modern. These kits can also be purchased in a single quantity for homeowners who are looking to revamp and update a worn shower. 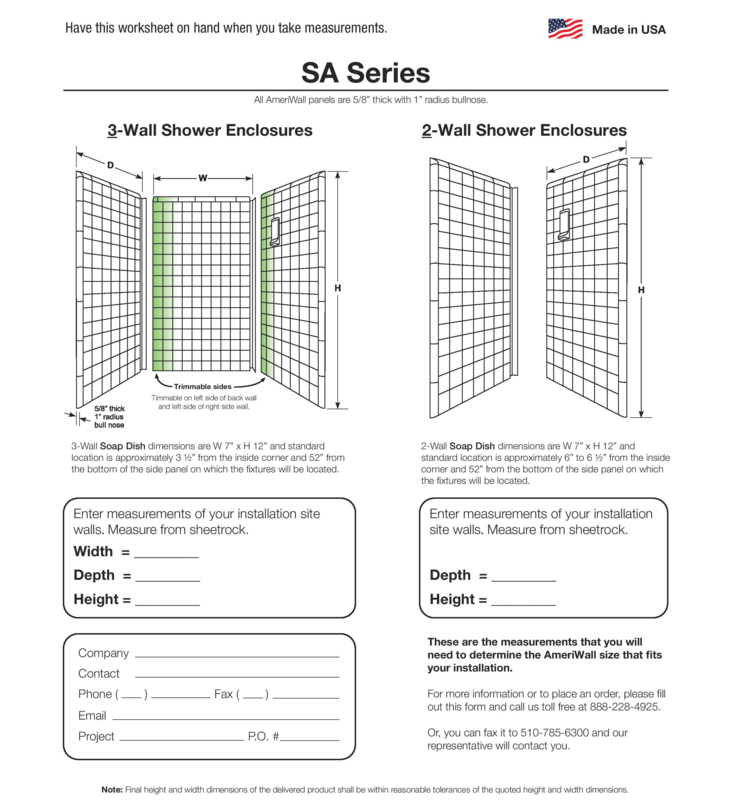 With a 3-panel shower enclosure, your existing shower walls will be completely covered. The shower walls are seamless, which eliminates water leakage and other common problems. Aside from the look and functionality of our shower enclosure kits, the price tag is what most of our customers enjoy. You don’t have to spend tens of thousands of dollars to get a modernized space. No matter if you’re purchasing a single shower enclosure or dozens of them, we offer a price that can’t be beat! 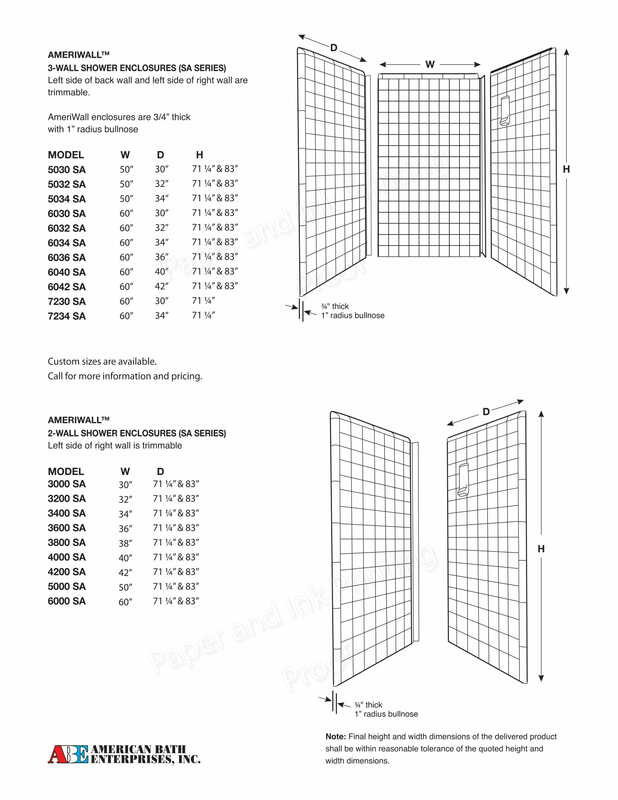 PACKAGING: $30 PER ENCLOSURE UP TO 62″ HIGH, $40 PER ENCLOSURE OVER 62″ HIGH, $15 PER BOX FOR WINDOW KIT, AND $10 PER BOX FOR CORNER SHELF. PRICES DOES NOT INCLUDE SALES TAX OR FREIGHT CHARGES AND IS SUBJECT TO CHANGE WITHOUT NOTICE. Complete any necessary plumbing before installing AmeriWall™ enclosure. ABE recommends that you install AmeriWall™ bath and shower wall enclosures over building code approved moisture-resistant sheetrock or other solid surface wallboard materials. NOTE: The wallboard material should not touch or overlap the vertical mounting flange of the bathtub or shower pan. For best results, leave a 1/8” gap between the bottom of the wallboard and the top of the vertical mounting flange. Step One: Dry-fit the panels. a) Before applying adhesive, dry-fit all the wall panels on top of the bath tub or shower pan. Step Two: Measure the width of the back panel and trim left vertical side if needed. Step Three: Drill plumbing holes. a) Carefully measure and drill holes in the panel to accommodate the shower head arm and mixing valve. b) Make sure the plumbing protrudes through panel when the panel is put into position. Step Four: Apply adhesive to left panel. Place the panel in position and apply pressure top to bottom on the panel. Step Five: Pull the panel away from the wall to allow the adhesive to de-gas and become tacky. Inspect wall and apply adhesive to fill the gaps where the wall doesn’t make contact. Step Six: Apply a bead of silicone caulk to the channel on the right side of the panel and the top of the tub or the shower pan where the panels will rest. Step Seven: Repeat step four through six for back panel. Step Eight: Repeat step four through five for right panel. Step Nine: Trim the leg kit to fit the height and contour of the tub and mount with construction grade adhesive. Step Ten: Clean all seams where the panels are joined and meet the tub or shower pan with Denatured Alcohol before applying silicone caulk. Step Eleven: Caulk all outside perimeter seams with acrylic latex caulk. Include the edges and the top of the panels. Liquid adhesive: Construction-grade adhesive and caulks tend to be very flammable. When using the liquid adhesive for installing AmeriWall™ products, be sure to follow the manufacturer’s instructions and warnings. Acrylic cleaning instructions: Wash with mild soap/detergent and lukewarm water, using a clean cloth or sponge. Rinse well and blot dry with a damp cloth or chamois. For stubborn stains or scuff marks, use Gel Gloss, an excellent one-step cleaner and polishing product, or any other acrylic friendly cleaning products available at most local hardware stores. For soap scum, use any acrylic friendly soap scum remover that should also be available at most hardware stores. Abrasive cleaners: Never use abrasive cleaners, strong household cleaners, window cleaning fluids, scouring compounds, gritty cloths or solvents on AmeriWall™ surfaces.